If I was stowed in a giant vault tasked only with writing blog posts until the end of time, fed only on a diet of cheez puffs and slushies, I would probably feel disgusting most of the time, but I bet you I wouldn’t run out of zany things to write! And if, in my old age, you were to pull me out from that icy fortress, I bet as I was blinded by a sun I had not known in decades I would hear the cyborg-children of the future beep-booping in a hushed whisper about the radiant splendor that מעלות תשע״ו (Maalot 2016) was and always will be. I blog for them, for their whirring and buzzing, and to show them. To show them it all. חידון (literally quiz, a trivia competition) around Yavneh history and lore. Though this writer can’t quite recall if team Li or Sa won, it’s safe to say that both teams won. Probably. We all had a blast so it doesn’t matter! The חניכים (campers) went to sleep with confident smiles and full hearts. חוג and headed by Jonathan Gomolka’s amazing efforts). To be honest, it was probably one of the best performances that has EVER graced the Yavneh stage and even though our חניכים were not a part of the play, you can be determined as daisies that they were part of the audience! Wow yesterday was Wednesday and it was אחלה יום and I’m gonna tell you ALL ABOUT IT EVEN IF YOU TRY TO GET AWAY FROM THIS BLOG IT’LL STILL BE HERE. 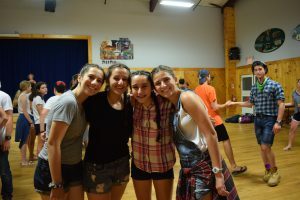 We stayed in camp for the morning, spending some time practicing for זמריה (the massive singing competition that some of you will be at TONIGHT and can give me CONSTRUCTIVE FEEDBACK on my BLOG POSTS so I can make them even BETTER for your READING PLEASURE) in the morning with the להקה (band). After a quick lunch we boarded a bus to head to the local movie theater to dive into Ghostbusters 2. It was pretty funny though I’m no movie critic. We returned to Yavneh to dive into the אגם and then spent the evening getting pumped up for זמריה the next day. After a bit more practice we returned to the צריפים to have a restful sleep and get ready for today. While this morning’s schedule has been mostly normal we are soon heading to record our זמריה songs to be immortalized forever. For all our first month parents, this may be the last blog post you will be reading from this writer for the summer. If so, it has been a pleasure serving you. *The poem “O Captain! My Captain” is being read in the background. * Though the next week may take your ילדים (children) far from us, we know that they will always be close to our עדה (age group) and hearts. We are so psyched to see you on Sunday!